Today has been a busy day. This morning I was out helping a family that is expecting twins and all afternoon I was shopping. So... this post isn't much. 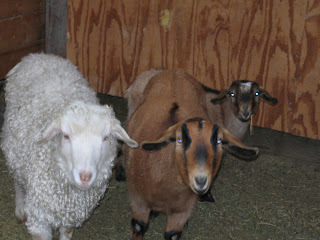 I am just going to introduce you to our three goats. Willow is the white curly one. She is a Pygora fiber goat. The pink dyed fiber in this post is hers. The brown one is Mandolin our Kinder milk doe. And the little one in the back is Tambourine her baby. I think they are pretty cute. And they are sweet and friendly, too.